Gloss and shine are the next big thing in upcoming interior design trends. From beautiful high-gloss ceramic accents to shiny stone counter tops, you won’t be able to get enough sparkle in your home. 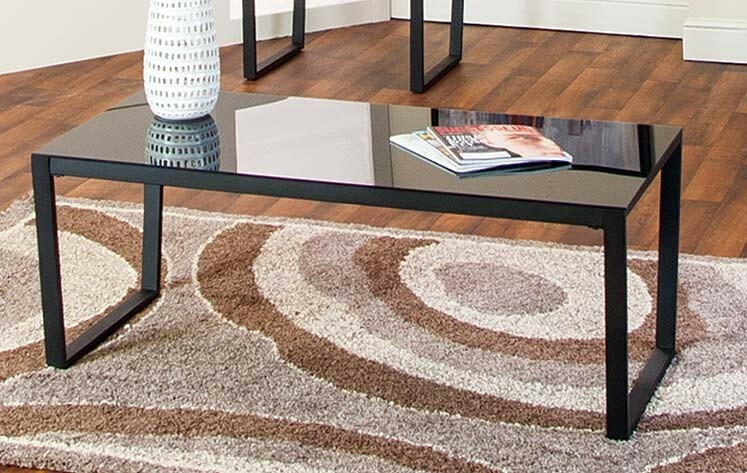 If you’re looking for an affordable way to give your living room a little style boost, you can’t go wrong with the black and glass Ferara 3 Piece Table Set. This set includes two matching side tables and a standard coffee table. Best of all, it’s under $200! You’re not going to find style and selection like this anywhere else. Visit an American Freight Furniture and Mattress near you, or keep reading to learn more about this incredible discount coffee table set. Bold and beautiful are two of the best words to describe the Ferara 3 Piece Table Set. This all-black coffee table with matching side tables features slim, rectangular table legs. The side tables have perfect square tabletops and the coffee table is a standard rectangle shape. Perhaps the best feature of this table set is the reflective or mirror glass tabletop. Each of the three tables are adorned with a sleek, reflective glass top that bounces light around the room. Whatever you place on the tables will reflect just like a traditional mirrored top. Where will you place this coffee table set in your home? We recommend tucking the tables around your living room furniture. The side tables will rest perfectly next to your favorite sofa sectional or in between two loveseats. Stage the coffee table parallel to your couch. This set will also look incredible in a den or home theater. The sleek, black design is easy to pair with any decor. From Traditional to Industrial, or from Avante Garde to Modern, these affordable side tables and matching coffee table will complete your room perfectly. How Can You Take Home the Ferara? It’s easier to get your hands on this gorgeous high gloss table set than you may think. All you have to do is visit your local American Freight Furniture and Mattress. There you can place your order, sign up for payment plans, enroll in our free layaway, or get same-day delivery for all in-stock items. Don’t stop at a coffee table set. Upgrade all your living room furniture under one roof. American Freight Furniture and Mattress offers everything from sofa and loveseat sets to floor lamps and other accessories. We even carry entertainment consoles and storage ottomans. Click here to find out where there’s a store near you. Do you have glass n chrome tables. Hi, Cleo! Thank you for your comment. We have a great selection of glass tables here: https://www.americanfreight.com/accessories/coffee-end-tables and here: https://www.americanfreight.com/dining-rooms visit a store near you to see our selection and try before you buy!